This pattern also contains the instructions for making the Lace prop bonnet. Two for the price of one! A beautiful bonnet which looks much more difficult than it is, add a bit of up cycled lace to make it even more adorable, or leave the lace and ribbon off and pop it on a baby boy. 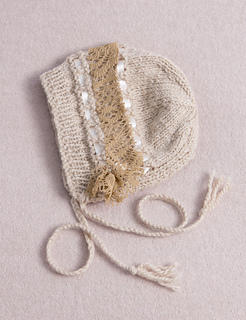 Knit the bonnet in colours to complement your rompers, skirts and pants for a total look. 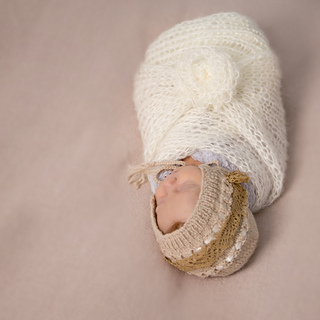 Make a lacey bonnet for a girl and a matching beanie for her twin brother, A-dorable! The trends are moving towards finer knits in newborn photography, this romper has instructions for sport, DK and worsted yarn, you can use a finer fluffy yarn if desired to get the lacey open look…just be sure to get match the gauge. Please ensure your garment complies with the safety suggestions in the e-book, particularly if the garment is for everyday wear. Patterns suitable for intermediate knitters who can confidently read a pattern and work in the round. All lace patterns are written and charted. The smaller size is for newborn prop (with no nappy/diaper) or very small newborns. The larger size is for large newborn prop, or regular sized newborns (up to 4kg). sizes/weights. Circle the instructions for your size and weight prior to starting. Rompers and Large NB pants require 2 balls of your chosen yarn; all other patterns require one ball. 3.25mm and 4mm needles, or size needed to obtain gauge. 4mm and 5mm needles, or size needed to obtain gauge. I work in the round using the magic loop method. If you prefer to use a different method please choose your needles accordingly. 24/22/20 sts to 10cm/4” in Stocking stitch after blocking but in a relaxed state (the swatch and the knitter!). I do not give row gauge as I give length measurements. This pattern has been professionally tech edited, however sometimes mistakes slip through, please contact me if you discover one.